New to this year’s program: Walk the Pilgrims’ Trail to the Cathedral of Santiago de Compostela. For the adventurous type, complete your 2014 Disquiet International experience with a three-day guided walk. Announcing a new collaboration with SLS Vilnius: Through a unique partnership between two of the world’s best international literary programs– DISQUIET Lisbon (June 29 – July 11, 2014) and SLS Lithuania (July 13 – 26, 2014) — we’re offering a special discount for participants attending both! Save $1200 (30% off each program) and see the literary sides of both Eastern and Western Europe. Faculty and guest writers include Erica Dawson, Tibor Fischer, Denis Johnson, Dorothea Lasky, David Lehman, Fiona McCrae, Eileen Myles, Josip Novakovich, Alissa Nutting, Padgett Powell, Miriam Toews, Katherine Vaz, Sasha Weiss,Terri Witek, Rebecca Wolff and many, many more. Space is limited. Apply now, indicating that you wish to attend both programs in the Notes and Special requests section at: http://disquietinternational.org/apply/ and http://sumlitsem.org/Lithuania/application.html. For more info contact disquietinternational@gmail.com or ann@sumlitsem.org or see: www.disquietinternational.org or www.sumlitsem.org. Two months left to go! Send your poetry, fiction, and nonfiction to the DISQUIET Prize! There’s just under two months left before the deadline for the DISQUIET Literary Prize! Our multi-genre contest will publish a winner in each genre: fiction in Guernica, non-fiction in Ninthletter.com, and poetry in The Collagist. 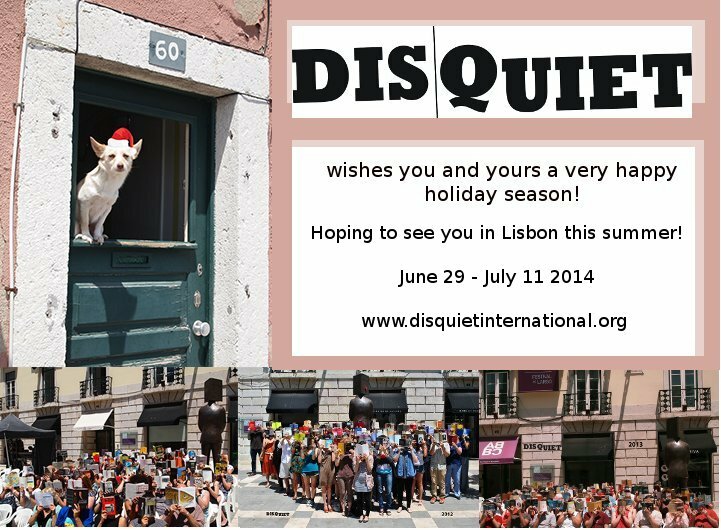 One grand prize winner will be chosen by an outside judge to receive a full scholarship (travel, tuition and lodging) to attend the amazing DISQUIET International Literary Program in Lisbon, Portugal, to take place June 29-July 11, 2014. The DISQUIET Prize is no longer limited to work with an international bent. So send us your best, whatever that is! Entry fee: $15 (US). One entry may include up to ten poems or a single prose piece up to twenty double-spaced pages in length. Use our easy Submittable form or see our contest page for instructions on how to enter by post. Submissions close Feb. 15, 2014.